African grey parrots have co-existed with humans for hundreds of years, yet breeders, sellers and owners have different opinions about which toys are best and about when to introduce them. 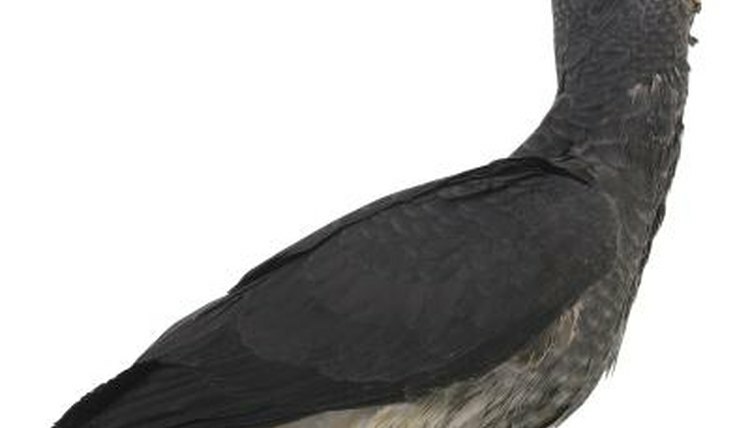 Researcher Irene Pepperberg and her late grey parrot, Alex, documented the intelligence of Congo African grey parrots; they’re as smart as human toddlers. The moment you talk to your grey, learning begins. Educational toys start as common items and progress from there. The first toys presented to greys by researchers at the Hagen Avicultural Research Institute are towels, emery boards and flight harnesses. Educational training begins when babies are feathered and nearly weaned from formula. Games involve getting used to being wrapped in towels, having claws filed, being misted from water bottles and being handled. These early lessons make vet visits easier, especially during that inevitable emergency. Greys are curious, but cautious. Once in a cage bring on the fun. Start with foraging games. Tissues over food dishes start the hunt. Place a toilet paper tube, filled with treats and ends closed, on the cage floor. As your grey matures, invest in acrylic foraging toys; they withstand beaks. Toys you think are neat, your grey may ignore. Don't get frustrated. Toys should be rotated weekly to prevent boredom. Greys will enjoy infant toys activated by pushing buttons; these toys play music, teach the alphabet or merely entertain with lights and sound. Your grey will have the strength to push buttons; just show her how. You'll be surprised one day to hear music coming from the cage, the parrot having mastered the skill. Older greys can be introduced to these toys, too, should you take in a rescue. Educational toys are tools to enhance your time together with your grey and entertain when you're away. Greys like to chew; so, invest in wooden parrot toys that fit your comfort level. Greys who spend long hours alone, need a variety. Check for wear and damage; routinely change toys. Avoid toys with small pieces greys can swallow. Hang toys so parrots cannot get their heads, legs or wings ensnared.